U.S. Rep. Beto O'Rourke, D-El Paso, says he raked in over $6.7 million for his U.S. Senate bid in the first quarter of 2018. It's an eye-popping number that poses a new category of threat to Republican incumbent Ted Cruz. Furthermore, the $6.7 million total came from more than 141,000 contributions — another record-busting number for O'Rourke. "Campaigning in a grassroots fashion while raising more than $6.7 million from 141,000 contributions, we are the story of a campaign powered by people who are standing up to special interests, proving that we are more than a match and making it clear that Texans are willing to do exactly what our state and country need of us at this critical time," O'Rourke said in a statement. 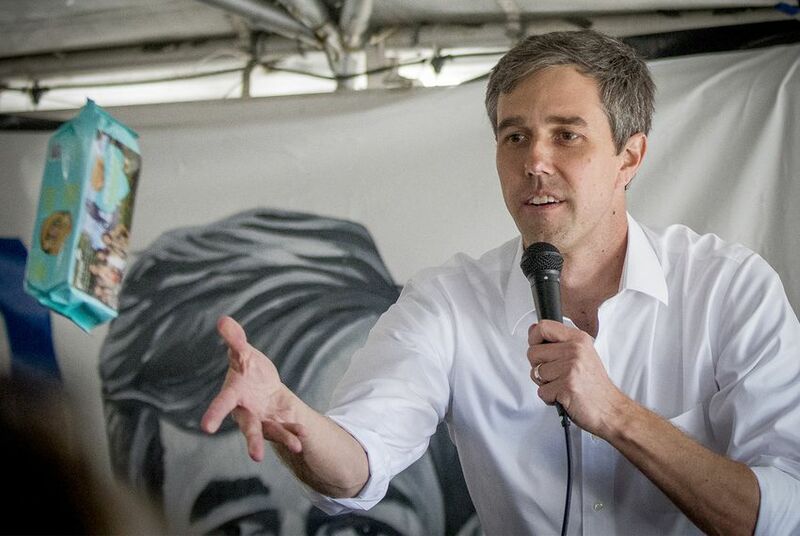 O'Rourke's campaign released the fundraising statistics Tuesday morning ahead of the April 15 deadline to report it to the Federal Election Commission. Cruz has not offered any numbers for the full quarter, though he disclosed raising $803,000 through the first 45 days of the year — a fraction of O'Rourke's $2.3 million for the same timeframe. On Tuesday morning, O'Rourke's team did not volunteer its cash-on-hand figure, but the $6.7 million raised is likely to go a long way toward closing his deficit with Cruz in money to spend. As of mid-February, O'Rourke had $4.9 million in the bank to Cruz's $6 million. Later in the day, during an onstage interview in Waco hosted by The Texas Tribune, O'Rourke said about 70 percent of his first-quarter haul was raised within Texas and that the average donation was "a little over $40." O'Rourke unveiled the $6.7 million figure on the second day of a three-day, 12-city trip by Cruz to mark the official start of his re-election campaign. O'Rourke is also hitting the road — he plans to hold town halls in 15 cities over the next six days. Cruz responded to O'Rourke's $6.7 million quarter Tuesday evening during a campaign stop in San Antonio. "That's a whole lotta money — there's no doubt about that — and it has been clear for some time that the hard left is energized and they're mobilized and they're angry at the president," he said. "And we are seeing all across the country, the far left giving millions of dollars to liberal Democrats running for office, and it underscores that Republicans cannot take November for granted in Texas." Rep. Beto O'Rourke, in long-shot bid for Senate, is no stranger to "calculated risks"
Beto O’Rourke fell short of expectations in the Texas primary. Was it because of his name?